Sitting at the foot of iconic Table Mountain, Cape Town has some of the most spectacular views anywhere in the world. Among the best places to enjoy these views are from the rooftops of the buildings that make up the CBD and surrounds, and the city has numerous rooftop bars and chill-out spots where you can grab a drink and take in the magnificent views. One of the latest additions to the selection of rooftop retreats is the Sky Bar at Village Lodge in De Waterkant. Situated just behind the trendy Cape Quarter, and with views of Table Mountain, the CBD and the V&A Waterfront, this upmarket bar offers top shelf drinks, delicious cocktails and a selection of tapas. The Grand Daddy Hotel in Long Street is famous for its rooftop trailer park that features several refurbished vintage Airstream trailers. Situated among the trailers is a stylish bar where you can kick back and unwind with your favourite drink or cocktail, and an amazing view of the city. They also screen classic movies during the summer months. Arguably one of the best places to view Cape Town in all its spectacular glory is from this breezy bar and lounge. 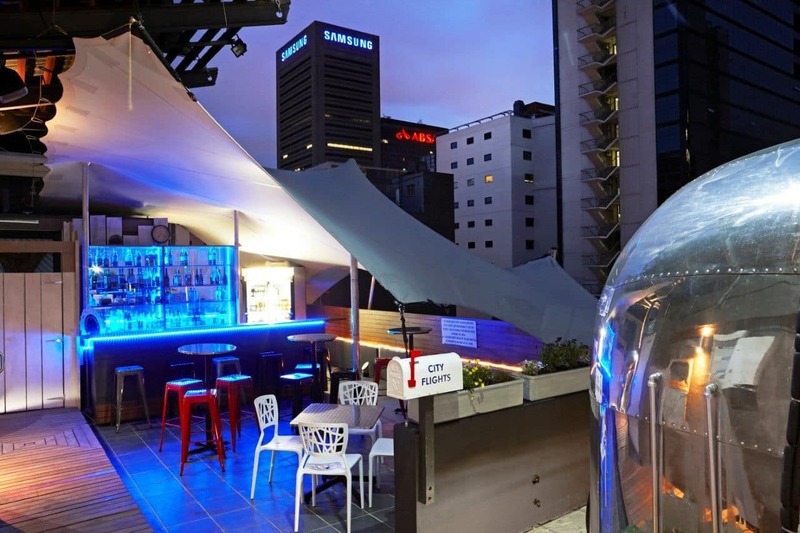 This 11th-floor rooftop terrace boasts views of Table Mountain, the CBD, as well as Cape Town’s bustling harbour, and offers a large selection of top quality drinks and cocktails, as well as light meals. Just around the corner, atop the swanky Cape Royal Hotel in Green Point, is the popular Zenith Sky Bar. Serving a large selection of classic and exotic cocktails, as well as Asian-inspired snacks and light meals, the Zenith offers impressive views of the city and the Atlantic ocean. Summer is when this spot really gets buzzing. A local favourite is the upstairs bar of the famous Rick’s Café Américain just off vibey Kloof Street. This is where locals come and enjoy an after-work drink or two, especially during the late sunsets and balmy evenings of summer. The bar offers an extensive selection of spirits, craft beers, and cocktails, as well as delicious light meals and tapas. Another City Bowl favourite is The Waiting Room. Sitting on top of the famous Royale Eatery, The Waiting Room is a live music space and a chill-out spot where you’ll find trendy locals hanging out and enjoying a laugh (ironically). The very top section of The Waiting Room has some incredible views of Table Mountain and the CBD, as well as the buzzing Long Street strip. They serve a selection of fine spirits and craft beers. If you’re looking for Cape Town’s hip, creative crowd, head over to Yours Truly, and their upstairs bar section, Up Yours. 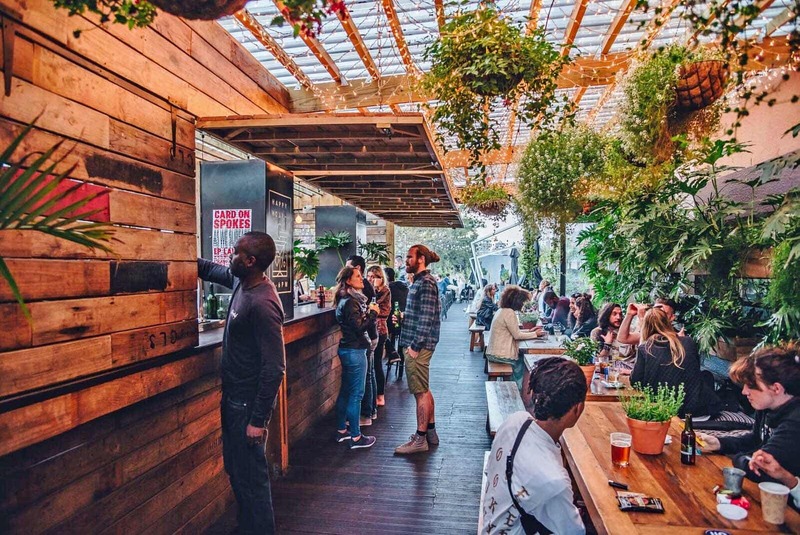 This popular after-work and weekend sundowner spot offers a selection of fine wines, spirits, and craft beers, and regularly feature DJs to give the vibe a boost. Another City Centre cool-crowd favourite is Tjing Tjing, a laid-back bar and lounge situated in a historic, 200-year-old building on Longmarket Street. Known for their large selection of wine, craft beers, relaxed vibe and Asian-inspired tapas, Tjing Tjing is where you’ll find the city’s cool and trendy locals, celebrating an occasion or just enjoying a drink. This Sky Bar and Lounge boasts with jaw-dropping views of the harbour, Lion’s Head and Table Mountain. The pool on the deck perfectly reflects the priceless pink sunsets and they serve breakfast, light meals, dinner and of course a host of sundowners, bubbly and wine.